I first saw MARIE ANTOINETTE, SERIAL KILLER by Katie Alender in Grace at Books of Love's BEA haul. The title grabs you and the cover is so divine. It reminds me of the infamous Let them eat cake!, comment Marie Antoinette supposedly said. So going into this feels like a win-win for me because I love the premise and I am fond of ghost stories. Plus this isn't just any ghost haunting, it's a ROYAL ghost haunting and I'm very curious to see how KAlender is going to unfold the plot. The first scene when you start MARIE ANTOINETTE, SERIAL KILLER is a teen beheaded by the vengeful ghost of France's most infamous Queen. And it doesn't stop there, the novel is interspersed with frivolous teens getting decapitated and there's a pattern. All of Marie Antoinette's victims are French teenagers who are so conceited and vain I wonder if she's punishing them because they remind them of herself or if there's more to the story than some Freudian exercise. Later on we find out that there's a method to her madness and the Queen's haunting is fueled by 400 years worth of revenge. The characters are a bit cookie cutter on paper. The lead, Collette Iselin, goes to a posh private school and went on a school trip to France with her cliquey friends, Hannah and Pilar, the former being the class Queen B. That will give you a fair idea of how things went down on this class trip. Typical YA clique drama, there's a lot of influential bullying, mean girl attitude and snobbery on Hannah's part and a ton of head nodding from Collette and Pilar to annoy you. But the scenes are classic mean girl tales so it's quite easy for any reader to get into the drama. The good part is KAlender kept this to a minimum to keep the focal of the story on Queen Marie Antoinette's haunting, the imminent threat she poses and solving the mystery of her revenge in a week's time. Collette is a great lead and despite following the formula of redemption, mean girl turned good girl, her character development is still cool to follow. The most interesting part about her character is her connection to Marie Antoinette and why La Reine is haunting her. It's not really that complex and one could easily surmise why but like other novels with this vein, one has to wonder what can a 16yo teenager do to stop the Queen's murdering spree? The backstory KAlender wrote to support this might be fictitious but it's believable and wove seamlessly with historical facts. I must say I'm very impressed. 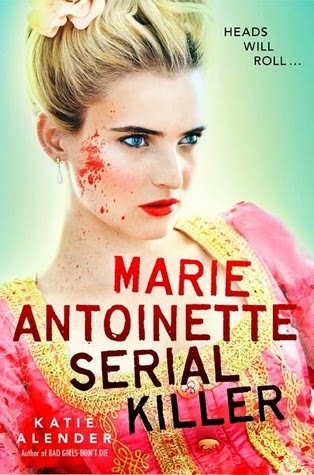 The best part about MARIE ANTOINETTE, SERIAL KILLER is the lack of insta-love and love triangle! Woot! There's some slight romance, the setting is in the most romantic city in the world so naturally there will be a boy involved at some point. But it wasn't the focal point of the story, it's really more of a crush or a brief fling than a passionate affair which was great because it didn't eclipse the mysterious elements of the story. So thank you, Katie, for not insulting our emotional quotient and for keeping consistent with Collette's characteristics. The only reason why I didn't give this a full 4 cauldron rating was the ending. KAlender built up the story really well and I was hoping for a different ending than what she gave us. It felt too easy and ordinary considering that this is Reine Marie Antoinette's ghost we're talking about and not some vengeful wench! I was expecting for something more spectacular and fitting for Marie Antoinette and not a simple exorcism. Then again, the backstory of the haunting is about betrayal, resentment, revenge, friendship and woeful regrets and that evened things up to an extent but not enough to be consistent with the build-up. 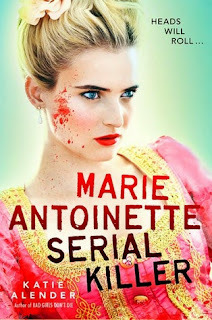 Still I'm very much pleased with MARIE ANTOINETTE, SERIAL KILLER, this is good shot of YA and I hope KAlender writes more novels like this. HA! This sounds CRAY-ZY! But in a good way! I don't know how I hadn't heard of it before! Collette sounds nice despite the predictability. She is but in a way I think taking the usual road to redemption did the story good otherwise it would've overshadowed the mystery of the story. Great review, I've been wanting to read this but was going to wait until I saw a few reviews to see if it was worthwhile. It's just the ending, I wish it were different.